I think we should keep out excel tanks from this, as this thread is meant only for DIY CO2 tanks. Seachem excel is not exactly a pocket friendly product and it is far too stable when compared to DIY CO2. @Tirtha: Love your angel tank. GOD!! So awesome setups. WOW. Seriously. Toomanyfish - The background looks astounding..What is it made of. Kuna - Its hrishi,not hirish bro..
CO2: DIY 2 - 2 ltr bottles, Co2 tube fed into air inlet of internal power filter. No diffusor. Filter: DIY Sump inbuilt in RHS side of the tank. Fauna: 4 Red Cherry BArb, 3 Mountain Minnows, 1 Betta Splenden, 4 Amano Shrimp, 4 RCS, 2 Oto's, 3 SAE's. 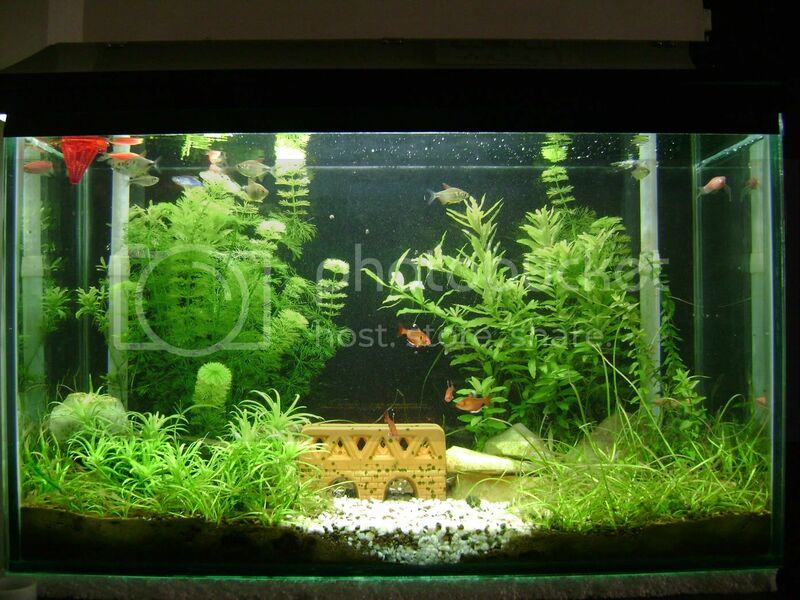 Flora: Java moss, Red Ammania, Pogostemon, Nymphea Red and green Lotus, Green Lily, Vallisneria Americana Spiralis, Glosso,, Ludwigia repens, Elatine Triandra, Red and Green Cabomba, Aponogeneton Crispus, Amazons, Vallisneria Americana, + 2 plants I forgot names for. another 2 -3 plants which I am not able to identify. Amazing DIY CO2 tanks. It would be good if ev1 can post other insightful details like substrate, ferts and lights along with the snaps. Please share more details of your tank. Its looking so vibrant. A full tank shot will apetize me. Even I feel the same, especially the BIG hole in purse. I hope it pays off much better for you and me.